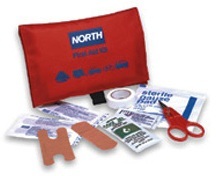 Individual Redi-Care Kit™: Soft-sided, durable, red nylon bag. Very portable. 39 pieces per unit. Flat trim design. Adhesive bandage, cloth, 1" X 3"
Adhesive tape, 1/2" X 2.5 yd.